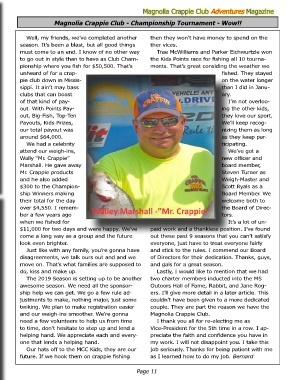 Magnolia Crappie Club - Championship Tournament - Wow!! season. It’s been a blast, but all good things         ther vices. clubs that can boast                                                                 ary. out, Big-Fish, Top-Ten                                                               they love our sport. We had a celebrity                                                                ticipating. ber a few years ago                                                                  tors. move on. That’s what families are supposed to          and gals for a great season. and our weigh-ins smoother. We’re gonna                Magnolia Crappie Club.